Smooth and enhance your clients' natural curl pattern. 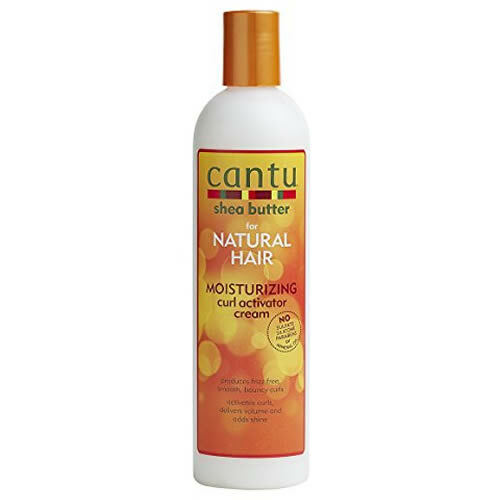 Cantu Shea Butter Moisturizing Curl Activator Cream is a gentle product that activates curls to reveal them as frizz-free and bouncy-looking, healthy hair. Shea Butter is brilliant at treating dry, itchy scalps and dandruff, too. It's a strongly-enhancing wash'n'go-style product that delivers plenty of volume and shine. It does this without resorting to harsh ingredients. This means you won't find mineral oils, sulfates, parabens, silicones, phthalates, gluten, paraffin or propylene anywhere in this product! £6.00 (inc. VAT) Why no VAT? We're a trade wholesaler and quote our prices without VAT to help our VAT-registered customers understand the true cost of a purchase. A sulfate-free shampoo that helps to reduce hair breakage and treats dry, itchy scalps as it removes heavy build-up in your clients' hair. Comes in a 400-ml bottle. A wonderful hydrating conditioner made with shea butter that moisturises brittle hair & reduces split ends & breakage. Good quality and great value black plastic comb for afro hair. 15-cm long and 6.5-cm wide.